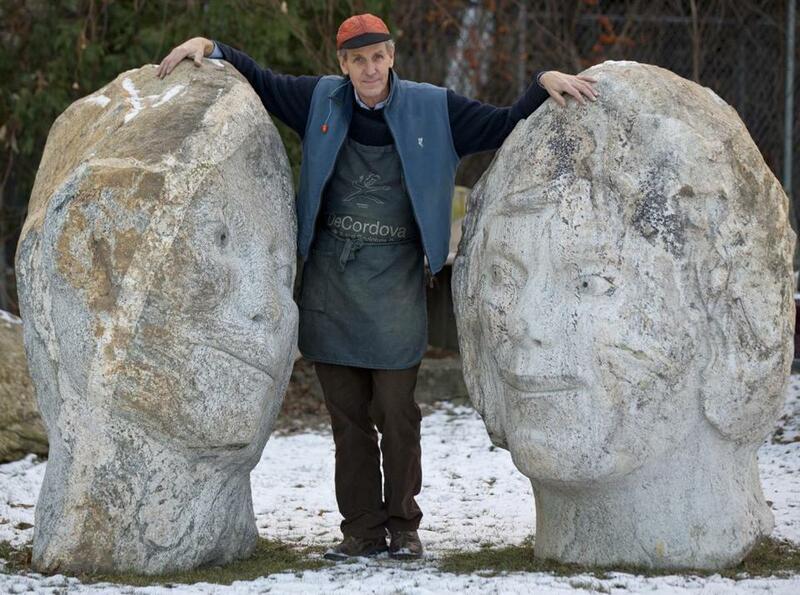 Mr. Wheelwright stood next to one of his granite pieces, "Loving Stones," outside his studio in 2013. 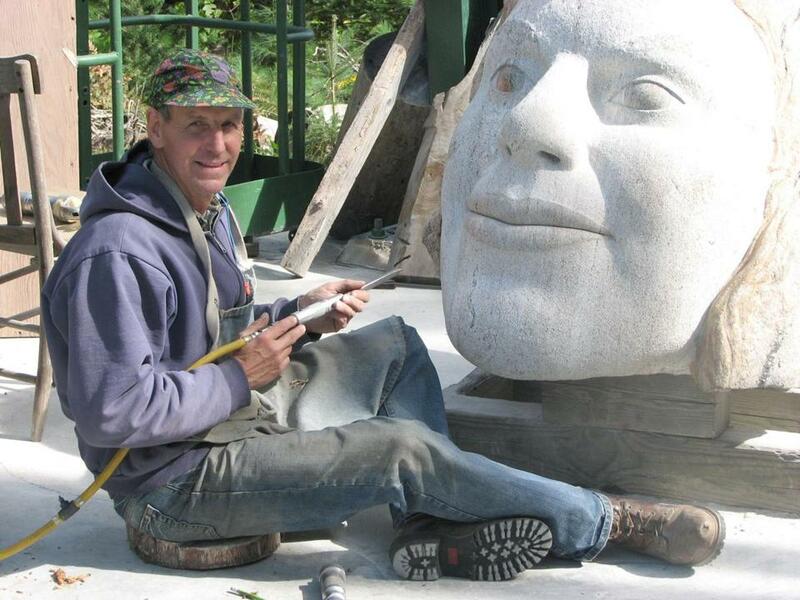 Like a celestial echo resonating from the night sky into the artist’s studio, the moon reappeared often in Joe Wheelwright’s work and is the subject of his most-viewed sculpture, “Sleeping Moon,” which slumbers imposingly in Dorchester’s Peabody Square. “I want people to see this sculpture and hear the music of the angels,” he told the Globe in 2006, after the Dorchester Arts Collaborative and the City of Boston picked his proposal for a work of art to adorn a site near Ashmont Station. For Mr. Wheelwright, the place his creativity resided could be anywhere. The faces and heads and arching figures he sculpted in Boston and Vermont appeared in galleries and museums from Massachusetts to New York to Florida. His imagination was just as unlimited, as was his choice of materials, which included ice for First Night sculptures, twigs and uprooted trees, gentle pastels and imposing boulders. 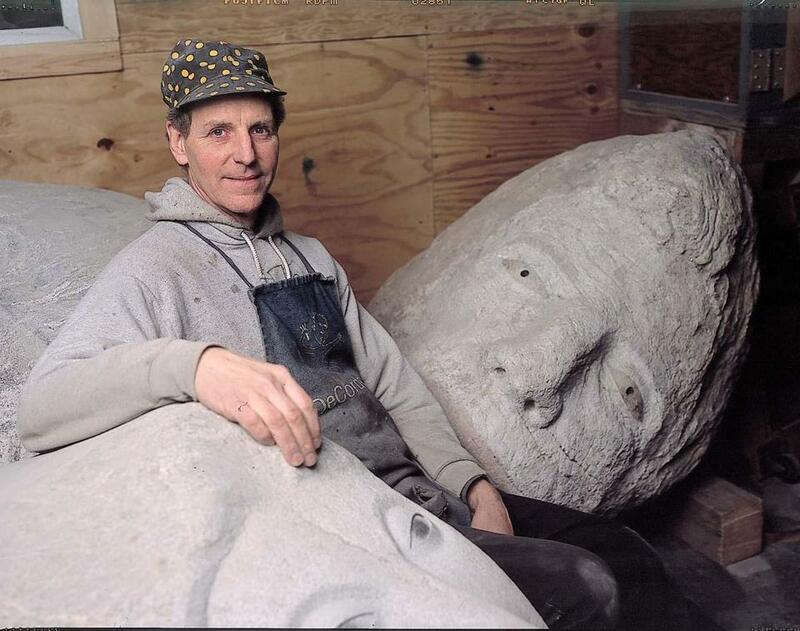 Mr. Wheelwright, who along with sculpting helped found Humphreys Street Studios and the Boston Sculptors Gallery, died of cancer Wednesday in his Dorchester home. He was 68 and divided his time between residences in Boston and East Corinth, Vt. Persistently ambitious, Mr. Wheelwright once wanted to create a replacement for New Hampshire’s Old Man of the Mountain, which collapsed in 2003. Then two years ago, he was trying to persuade the Peruvian government to let him carve a giant head into the Andes mountains, which he envisioned as the planet’s biggest work of art. “The world is ready for an eighth wonder of the world,” he told the Globe at the time. Mr. Wheelwright in his Boston studio in 2003. Among the comparatively smaller wonders he crafted were sculptures made from trees that he carefully uprooted, roots and all. Augmented by other materials, his tree figures stood upside down and stretched skyward 27 feet or more. They possessed a dreamlike quality that had its beginnings in the artist’s childhood unease. Reviewers could almost feel Mr. Wheelwright smiling in his studio when he created certain amusing tree figures, or when he crafted earlier smaller sculptures from twigs, such as those that appeared in a 1986 show in Newbury Street’s Zoe Gallery. “The figures are zany, thanks to the sympathetic interaction of Mother Nature and the artist: Wheelwright exaggerates the gesture already present in the tree, so that the widely splayed branches of a twig become stretching legs walking up a wall,” Globe critic Christine Temin wrote in December 1986. During his many years sculpting different materials, twig renditions of trees were succeeded by actual trees, and small stones ballooned into granite boulders that stretched five feet across, lending heft to the humanity he chiseled into each surface. Included in his 2003 deCordova show was “Listening Stone” — a head that inclined an ear toward the earth, as if listening to eternity’s faintly ticking clock. Nature, Mr. Wheelwright decided years earlier, would always provide fresh material to stir his imagination. Joseph Storer Wheelwright was born in New York City and grew up in Western Massachusetts, a son of Dr. Jeff Wheelwright, a physician with a practice in Pittsfield, and the former Mary Matthiessen. At Yale, where Doonesbury creator Garry Trudeau was a roommate, “friends were adhering to him” based on the warmth of his character, recalled Mr. Wheelwright’s older brother, Jeff of Morro Bay, Calif., who was a year ahead at the university. He relocated to Vermont to begin working as an artist and then studied sculpture at the Rhode Island School of Design, from which he graduated in 1975 with a master’s in fine arts. In 1971, he married Susan MacGregor. They bought land in East Corinth, Vt., and had two daughters, May of Washington, D.C., and Tess of Ithaca, N.Y. In addition to his wife, two daughters, his brother Jeff, and his twin, George of Rockport, Maine, Mr. Wheelwright leaves his mother, of Camden, Maine; two other brothers, Peter of New York City and Nat of Brunswick, Maine; his sister, Molly of Tucson; and two grandchildren. A private gathering was held in Vermont, where Jeff said Mr. Wheelwright was buried in a casket made by his twin, who is a woodworker. Small pieces of Mr. Wheelwright’s art were affixed inside. The family will announce a public memorial gathering at joewheelwright.com. As Mr. Wheelwright sculpted, he coaxed life into granite crescents — each face training an enigmatic gaze at those who visited his shows. 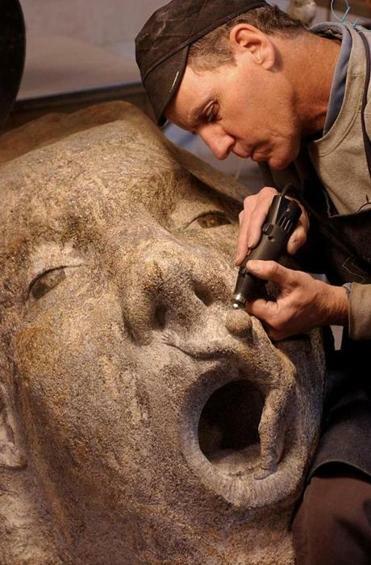 His sculptures, he once said, were “sentient beings that are there communicating with you, if not cavorting.” For him, the humanity of the art and the audience were inseparable.